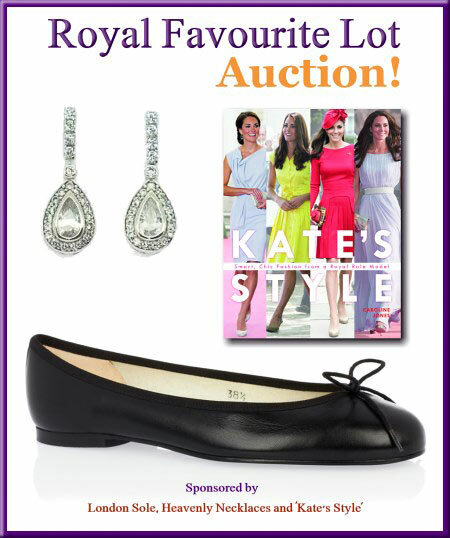 This weeks Baby Cambridge Fundraiser activity is another exciting charity auction fans of Kate's style are sure to love! 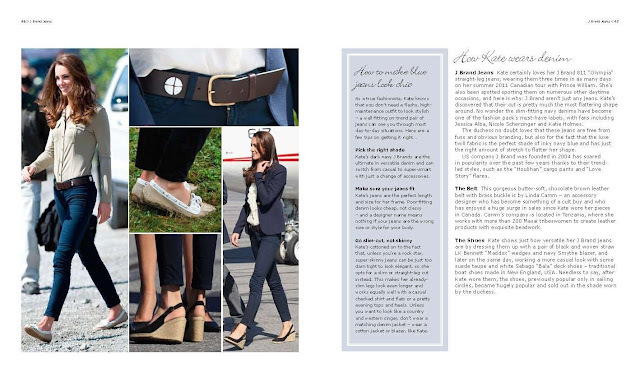 The Royal Favourite Lot includes three items from royal favourite brands London Sole, Heavenly Necklaces and a copy of Kate's Style: Smart, Chic Fashion From a Royal Role Model. As always 100% of the proceeds go to Kate's patronage East Anglia's Children's Hospices via Ebay for Charity. The first item is a gorgeous pair of Henrietta Ballet Flats kindly donated by London Sole. The chic yet comfortable shoes are perfect for this time of the year and can be worn to complete a causal daytime look such as jeans and a top or worn with a dress for evening wear. The Duchess recently wore her Henrietta's during an antique shopping trip in Berkshire. London Sole (French Sole in the UK) was established by British shoe designer Jane Winkworth who has been described by Vogue as the "Queen of ballet flats". The company made its mark by combining classic ballet flats with never before seen colours, textiles and materials. All London Sole products are handcrafted in Europe and have been worn by a number of royals and celebrities including the late Princess Diana, Kate Moss, Pippa Middleton and of course Kate. Below we look at the Henrietta in three pretty new colourways. There are a number of exciting new styles available including the pointed-toe Camden. The toe is very sharp but not elongated and the drawstring bow is fully adjustable. 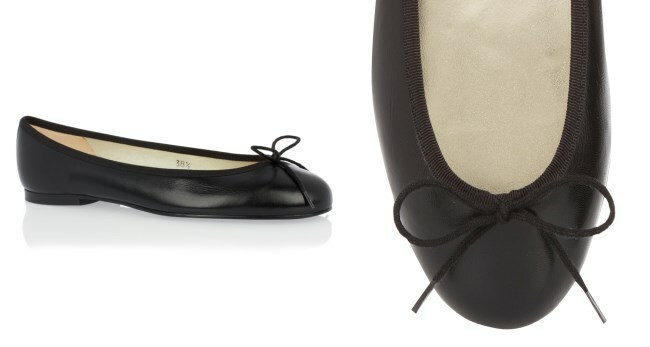 We also look at the Knightsbridge - a pretty leather ballet flat with an elegant low vamp and a 10mm heel. The glitter bow trim is a lovely addition to the shoe and they're an excellent choice for evening wear; perfect for those of you prefer a flatter shoe to high heels on an evening out. The pink is particularly eye-catching. The brand has launched a fantastic new website and to celebrate they're offering Free Delivery to all customers in the USA and Canada until the end of July. There's a beautiful selection of ballet flats, flat shoes and smoking slippers on the new site. You can view them all here. Keep up to date with all the latest news by following London Sole via Facebook and Twitter. 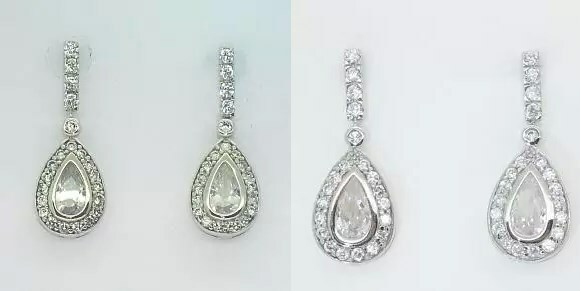 The second item in the lot is a pair of Fabulous CZ Earrings kindly donated by Heavenly Necklaces. The £58 classic teardrop 'diamond' is surrounded by just the right amount of channel-set round ones. The antique-looking earrings are 27 mm long. 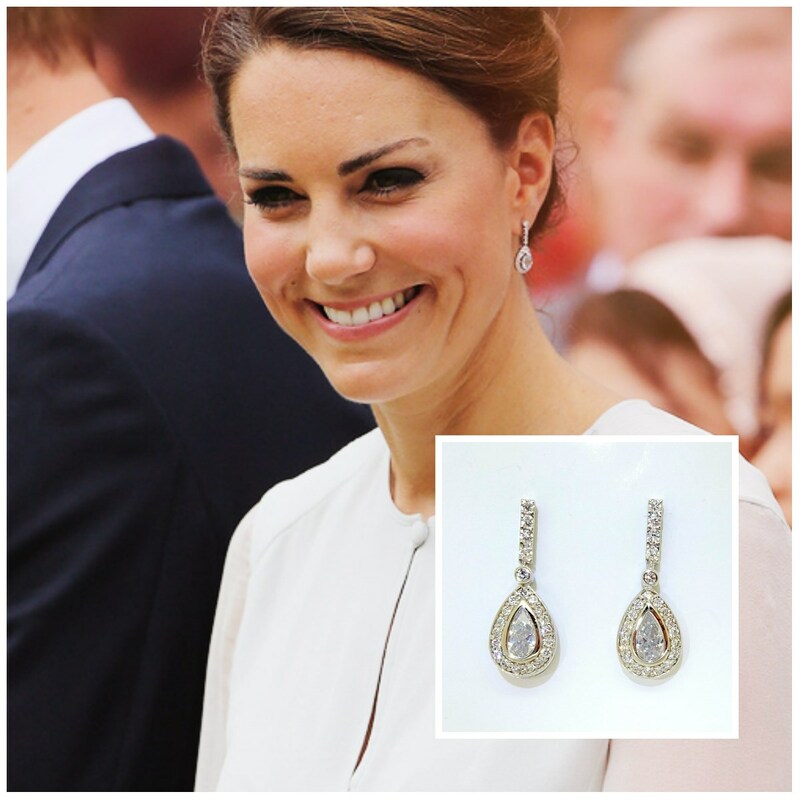 As you can see they are a perfect replicate for the diamond teardrop earrings worn by the Duchess in Kuala Lumpur last year. Heavenly Necklaces are suppliers of the finest fake diamond jewellery to royalty and celebrities all over the world. The Duchess and the Countess of Wessex have been fans of the brand for some time. Below we look at four striking necklaces. There is a beautiful selection of earrings available at very affordable prices. Perfect if you're looking for a gift for someone or to treat yourself! To see latest pieces and for news on the brand follow the Heavenly Necklaces Facebook Page. 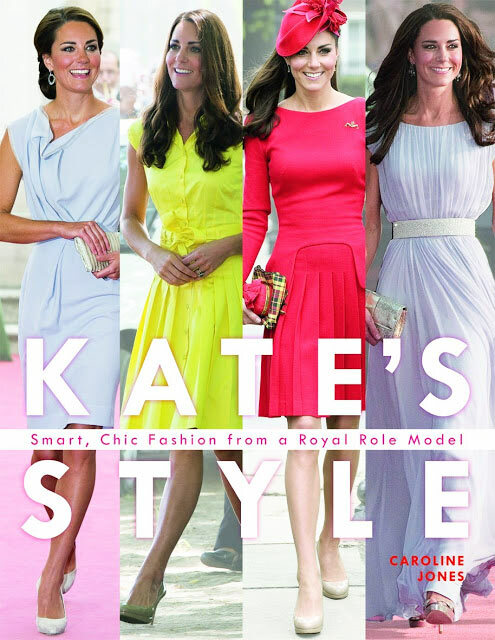 We also have a copy of Kate's Style: Smart, Chic Fashion from a Royal Role Model by lifestyle author and journalist Caroline Jones. 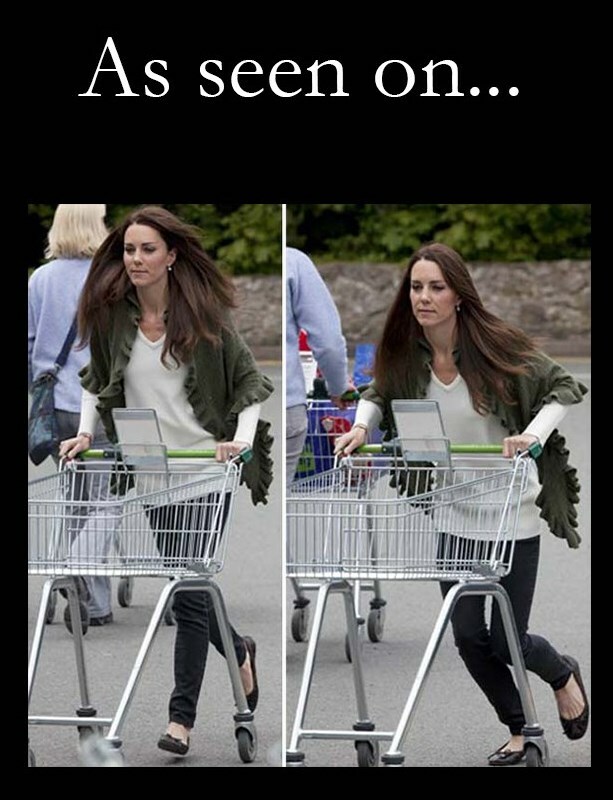 As we all know Kate is considered a style icon and women all over the world are interested in replicating the Duchess's looks, this book is something of a guide for those who wish to do so with an array of helpful tips and tricks. I read the book over the weekend and very much enjoyed it! It's 176 pages long and written in a fun and informative manner. 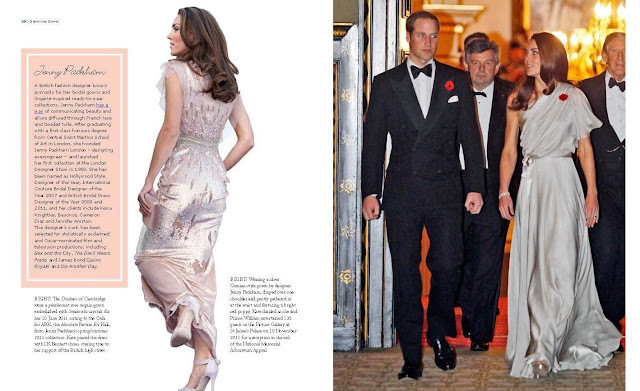 I particularly enjoyed the sections where Ms. Jones goes through Kate's designers such as Jenny Packham. There's a close-up look at a number of Kate's best loved outfits - sharing details of everything from garments to jewellery and clutches. 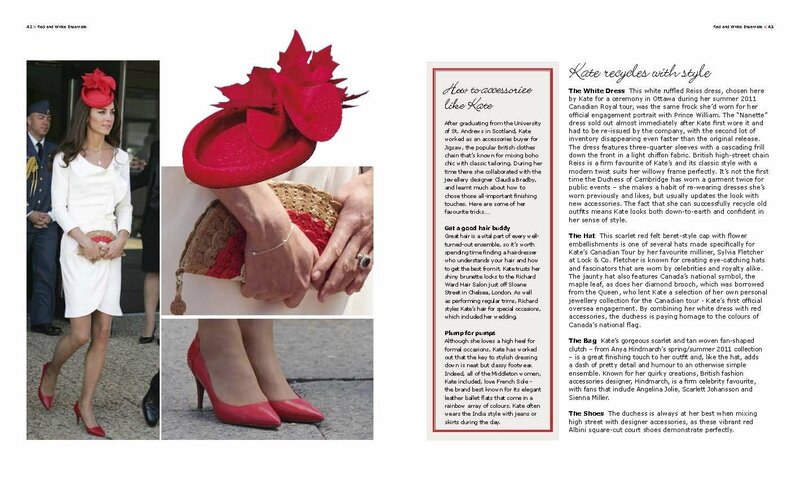 It's interesting to look back on Kate's sartorial choices and to see the accessories she chooses for her looks, whether it's on a royal tour or a gala dinner. The photos are a real treat, with a wide and varied selection from Kate's St Andrew's Days all the way up to the royal tour last year. There's also a cursory look at Carole and Pippa's style as well as a variety of tips and tricks on Kate's hair and beauty secrets. Kate's Style is available at Amazon, reduced from £17 to £12.79. The auction can be viewed here. With many thanks to London Sole, Heavenly Necklaces and Carlton Books for their generous donations. Wishing all bidders the very best of luck! As you all know we've had a series of fundraising activities in recent months to reach our goal for East Anglia's Children's Hospices. 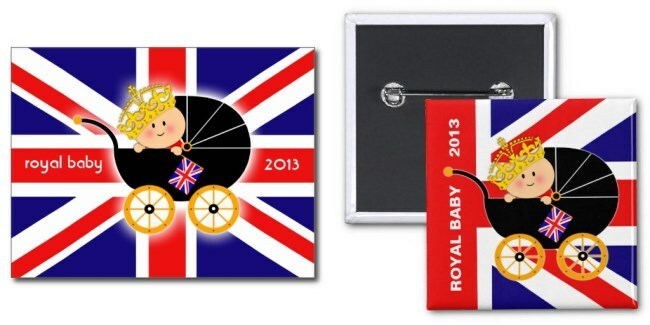 With the arrival of the royal baby we thought you might be interested in seeing the Baby Cambridge Fundraiser Charity Shop at Zazzle. The shop has six categories with a number of interesting items created by the lovely and talented Dash! A look at the Love, Baby, Crown category. The British Royal Baby designs are my personal favourite and excellent keepsakes to have to remember the royal baby's arrival. Below we look at the $1.50 Postcard and the $4 Baby Button. As with many of the items the Royal Baby Mug is customisable and comes in several styles. Again, as with all of our activities all proceeds go to EACH. I'd like to thank you all for your support throughout the fundraiser thus far. It's incredibly heartening to see the charitable spirit among so many of you! Charlotte how do you do it? Have you gotten any sleep? Wonderful post. I must have the steel coffee mug for during the school year that is what keeps me on my feet. I do feel it will happen this week. London must be going crazy along with Andy winning the tennis match. Congratulation 77 years without a win! I will keep checking back fingers crossed. Have a good day. Very little sleep but we're having glorious weather :) I try to do my fundraiser posts on Mondays and prepare them over the weekend meaning it doesn't interfere with my regular blogging schedule and other work during the week. Those pointy shoes have my name on them! THANK YOU for sharing Charlotte!!!!!!!!!!!!!! A huge Congratulations to Zara and Mike. It will be so nice for Baby Cambridge to have a cousin his/her own age. That must have had to been exact timing for zara to announce her pregnancy so as not to steal the limelight from will n kate when theirs arrive. I think it's great that Baby Tindall and Baby Cambridge will be so close together in age. William and Zara are about a year apart, I think, and they have always seemed to be great pals. I've just been enjoying old videos of the various royal christenings (Great fun to watch--especially right now! ), and Zara and William were really playing together quite exuberantly at Harry's christening celebration! The Baby Cambridge charity shop is a great idea. May it raise a lot of money for EACH. So happy for Zara and Tindall, too. I'm sure they'll have an adorable baby, as Savannah and Isla Philips are. They are soooo cute. It's wonderful to know that! It's funny, the distance between the city I live in and Monte Real is just 60km. Hi, Z! That is so neat! I was last in Portugal in August of 2006 and 1981 before that. I need to go back again soon because there is still so much to see! My absolute favorite place in Monte Real was the train station. My mother lived in a small apartment in that train station when she was growing up. My grandfather was the chief of the station at the time. Now my uncle and a cousin have homes directly behind the station. I can't wait to go back. Hugs to you, too!! :o) V.
Great post again Ms. Charlotte. I feel we still have a baby this week. But I read today that William is putting in extra shifts. To me that is silly. He should be by his Duchess side as much as he can waiting for the birth of their baby instead of being 700 miles away. I just don't understand. Oh well all that matters is that he make's it to her bedside when she goes into labor. @Pauline: William has been putting in regular shifts, not extra shifts. "Putting in as many shifts as possible before paternity leave," as reported by Eonline, is not the same as working extra shifts. It makes perfect sense to clump shifts together when you're required to fulfill a certain number of hours every 2 weeks. He will also have to keep up "flying hours"---wise to get in as many as possible, then won't have to worry when the babe arrives. I wonder if he is putting in extra shifts in order to have some more time off in addition to his paternity leave? If so, I can definitely understand that decision! You're awesome! Thank you so much for these posts. The giveaways for the EACH fundraiser are beautiful! Congrats to Andy Murray and to Zara and Mike-all great athletes! May they all be happy professionally and privately. I'll make you laugh-just returned from my cottage,a few hours north of Toronto-no phone, no Internet and satellite TV taken out by thunderstorms-not the best situation for tracking Baby Cambridge news! My husband and son wanted to know why I was in the car, checking the all-news radio station. My son now knows me well enough to guess it must be about "the Duchess..." Can't go for any extended stays up North (as we call it here) until Baby C. has safely arrived! How wonderful to be on the edges of our seats awaiting happy news...! Those were some storms. Hi from another Muskoka/Almaguin reader! I thought I read somewhere that the policy for air rescue pilots is that near their wife's due date they don't have them flying as they feel their minds won't be 100% on the rescue. So for that time they do ground duties. And that they have a colleague on standby to fill their shifts when they are called away for the birth. I must admit I find it strange that kate seems not to have gone to Anglesey for mist of her pregnancy. ( according to reports) I wonder if William commutes back to London on rest days. Pauline I agree with you! Baby Cambridge is coming this week. Hi Pauline-Oak Hills, I'm probably already a crazy person, but I wouldn't want my husband hanging around doing nothing but waiting. He would drive me crazy! Better to have him working and building up credit against the necessary time off later on. Even if he doesn't have to build up any credit to be able to take time off, I wonder if William does it because it's a positive thing to help his team spirit in his work environment and maybe helps his own frame of mind? I'm sure he and Catherine talk on the telephone a lot while they are apart, and that way not feel each other's absence as much. He must be feeling a little overwhelmed by the thoughts of imminent fatherhood, don't you think? Of course this is all my own speculation. What do you think? Hi Marci- Your not crazy...lol But with William's work schedule he woudl not be with her all the time. I just think it is funny that he is what 700 milles away from London and it is going to take about 70 miuntes by chopper to get him to London if he is not already by her side. Oh well let's just hope baby comes this week and the Duchess has a short & safe labor. I think both of the are really excited about becoming parents. And yes maybe by working for William helps take some to the stress off but it might just add to the Duchess not kowing if he will make it in time. Marci, you are NOT crazy. :) Many of us would prefer to have hubby occupied rather than underfoot adding to the stress of the moment. Kate has always been a strong, well grounded young woman and whatever "formula" William and Kate have has always worked for them. I just don't see the pregnancy suddenly turning her into a needy person. Anglesey is less than 300 miles/480 km from London, not 700 miles. I'm sure William'll be on his way as soon as labor looks like it's progressing. And first babies can take a long time coming. I agree with Marci and royalfan that having a husband hanging around wouldn't help. Much better to have paternity leave. The charity shop is a great idea. I'm treating myself to a mug! I hope the Duchess is relaxing and enjoying her final days of pregnancy. Although it is common for healthy first time moms to be about 10 days late. We could be waiting until the 23 or even longer. I would hate not being able to get out and about for that long. I hope she has plenty of visitors to entertain her. I can't help but think that it is odd that the palace would release a statement when she has gone into labor. I only wanted close friends and family to know I was in labor, all other friends had to wait until after the baby was born. It would be weird to know that the whole world knew your uterus was contracting. Seems a bit odd, too private for everyone to know?!? I have never heard that the palace plans to release a statement when Kate goes into labor. My understanding is that the first official announcement to the public will be the notice on the gate at Buckingham Palace proclaiming the birth of a prince or princess. Has there been a change in protocol that I haven't heard about? I have heard over and over that the palace will release a statement when she has been admitted to the hospital. From multiple news outlets. It seems horribly obtrusive. Some have reported that it was announced when Diana was in labor as well. I agree with you 100%. Those first moments, when it seems there is nothing else but the newness of your family, are the best moments in life. Here is one of the articles that say her labor will be announced. I hope for her sake it isn't true. Thank you Pauline & RoyalFan for thinking I'm not crazy . . . ha ha fooled you :-D I am soo with you--I hope the baby comes this week. But of course I hope more that it comes when it's ready and that the Duchess doesn't have too hard a time with everything involved. Charlotte, I forgot to say I love the review of the book and the baby items. I would so love to be able to wear those pretty flats, but alas! my feet are too short and too wide. They don't make my size. I am so excited. Cannot wait until the baby is born! she is supposed to be due today.